I’m not exactly sure what it is about the business of mail delivery, but a surprising number of the vehicles designed specifically for this purpose end up looking adorable. Look at the VW Fridolin, or the Goggomobil postal vans — freaking huggable. And now here’s one more oddly charming little mailman: the DAF Kalmar. The DAF Kalmar (also known as the Tjorven, after a “plump and sunny” little girl — also called ‘sturdy and nosy’ — from some ‘60s Swedish TV show) was developed in the mid-’60s when the Swedish postal service decided they needed a purpose-built mail vehicle. They went to the Swedish truck and utility vehicle company Kalmar Verkstad, who in turn looked to the Dutch company DAF for a viable small delivery truck platform. They picked the DAF 44 as the basis of the new van, which makes sense when you think about what a mail truck is designed to do. The DAF 44’s 844cc flat-twin wasn’t exactly a screamer at 34 HP, but that’s plenty for delivering the mail. Well, it’s plenty when the phrase “delivering the mail” is used literally, and not screamed from the window of a Trans Am. Also, the DAF was one of the few European small cars to offer an automatic transmission, the Variomatic. The Variomatic was the first real CVT transmission, and for the contstant low-speed, starting-and-stopping job of a mail truck, I’m sure the Swedish post-people’s left legs were happy to be freed of clutch duty. The first prototypes, of which 19 were built, had the basic and iconic tall-greenhouse, huge-window look down, but had a sort of terrified/horrified-looking face. These were actually based on the DAF 750, but they had the sliding doors that would survive on the production Kalmars. They also had seats that looked a hell of a lot like a pair of office chairs. The production versions cleaned up the looks a lot, and the result is an awful lot like the sorts of cars you’d see in a cartoon — big round lights, huge, tall greenhouse with massive windows, and many didn’t have a grille or front air intakes. The DAF flat-twin was air-cooled, and I suppose in Sweden it’s usually cool enough that under-bumper air intake was sufficent. Some did have some little moustache-like vents, or a full grille, though. Also, the body was fiberglass, which was probably a good way to avoid the rust that devoured so many 60s and 70s-era European cars. They even made a pickup version and a Combi, which had an actual back seat instead of Swedish Postal Service mail trays, which is how I like to spec all my cars — Swedish Postal Tray Delete package. The design got a mild update in 1970, and ovver the course of the 1969-1971 run, about 1200 were made, with very few exports. Personally, I’m really smitten with these little workhorses. They seem like they’d make wildly useful little cars to have, with their big sliding doors, small outer dimensions enclosing a significant amount of people and cargo room, and what I bet would be a really airy interior. I feel like this thing has the qualities I like in cars like the 1st-en Scion xB, or so many Japanese Kei-vans. I’d love to see a modernized, tall, fun-looking, boxy, sliding-door city car make a comeback. I know the sliding door thing has been tried with the Peugeot 1007, but no one’s had anything like that here in the US for a while. Scion, are you paying attention? Time to euthanize the current xB and look to something genuinely novel like this for that boxy car’s rebirth. 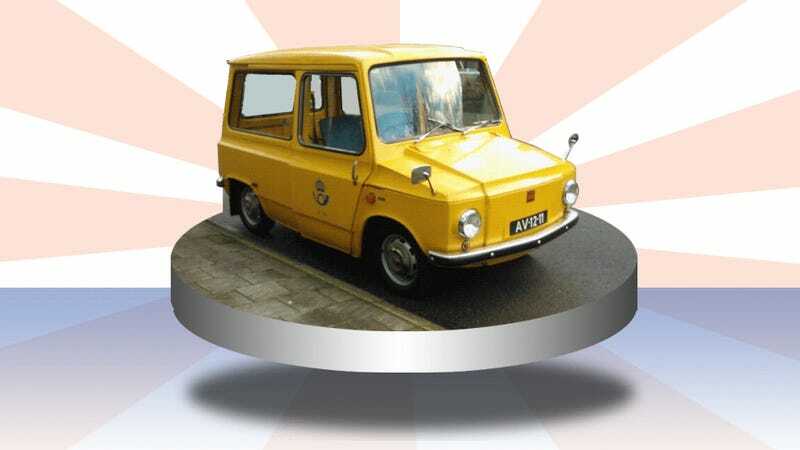 I’m sure it’ll be an easy pitch to the higher-ups to say that you think the next xB should be based on a ‘60s Dutch/Swedish mail truck that you read about from something written by a career idiot. I’m available if you need some slides, hypothetical Scion product planner.